May 29 was predicted to be a poor thermalling day. I caught the taxi up with the expectation of making two or three flights in the day just for practice. 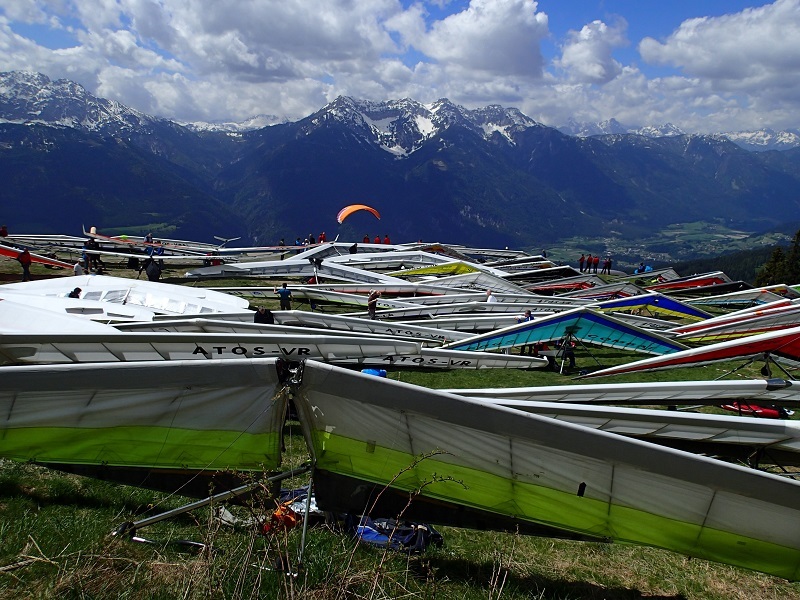 The take-off field was crammed with gliders for yet another German hang-gliding competition. No chance of getting off early. The competition task was short: a speedy zig-zag across the valley and then to the landing field. 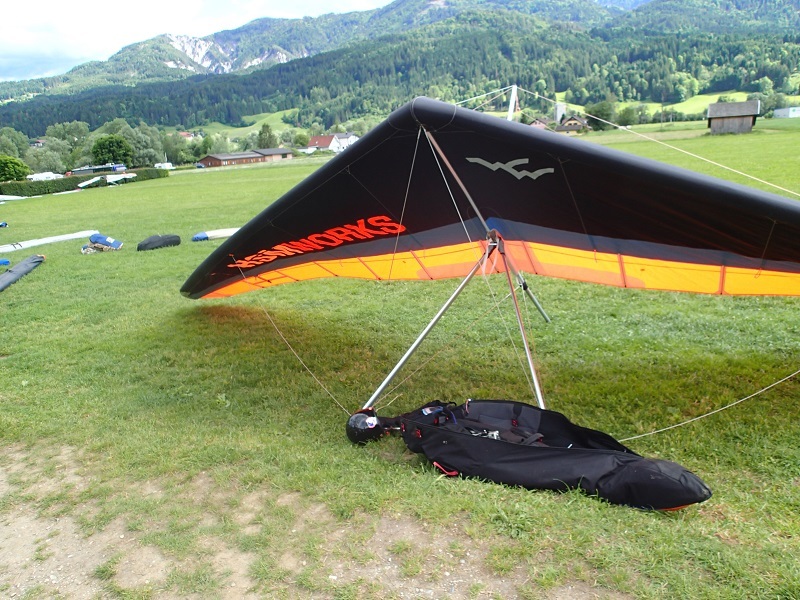 By the time there was enough room to get to the front, there were all sorts of antique gliders being set up, including an Airwave Calypso, which is the kind I flew when one belonged to the Bristol University Hang-Gliding Club in 1991. 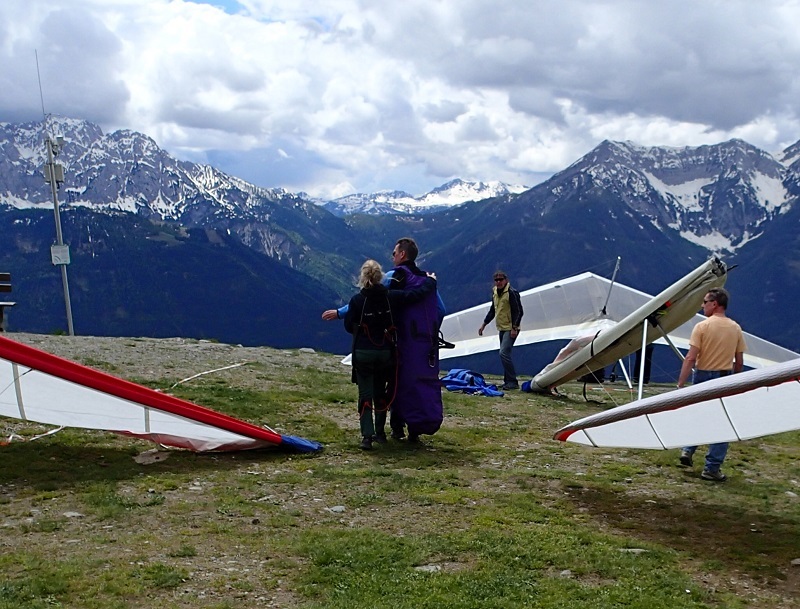 Imagine the days when almost every British university had its own hang-gliding club. It boggles my mind. 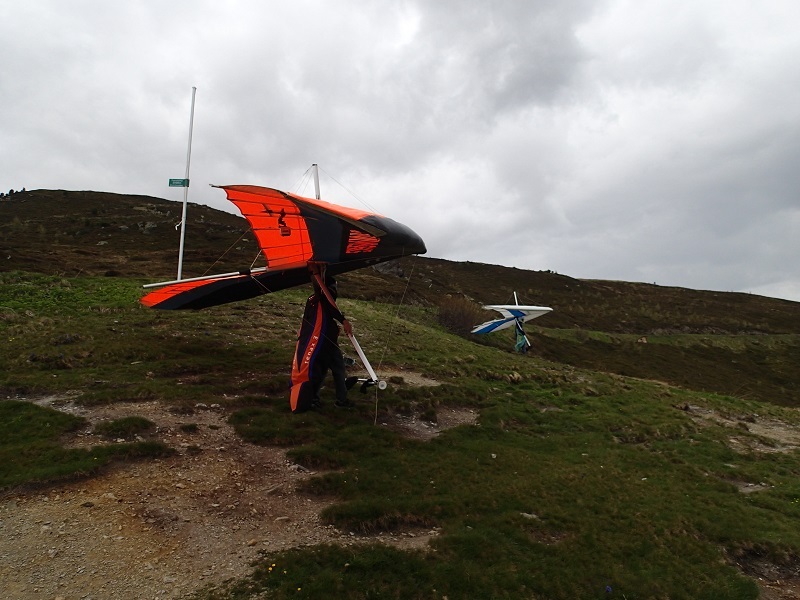 There were two tandem gliders preparing to take-off. 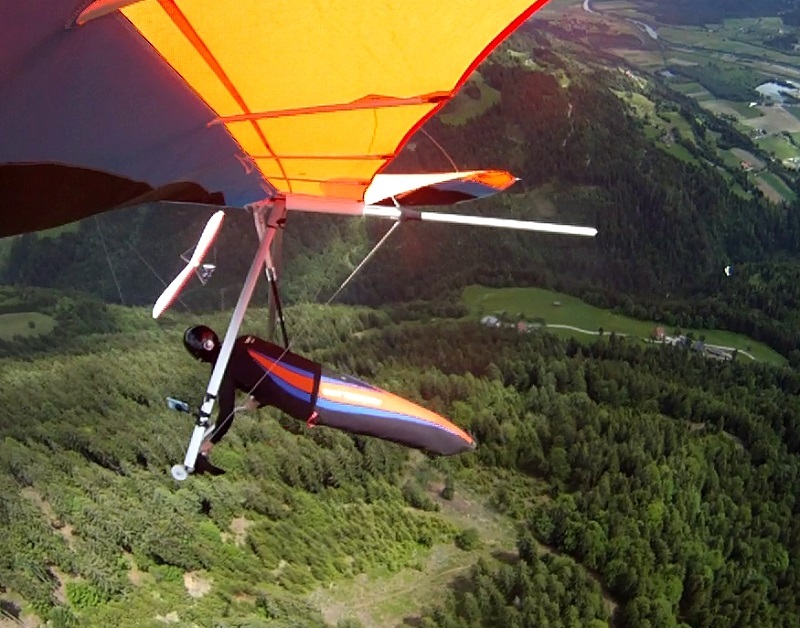 These tend to be large, inefficient, slow-flying gliders that waft around on big sails. The co-pilots were both blond girls with no fear. Here is one of them being shown how they will run down the ramp without tripping over. I stopped prevaricating and delaying my own take-off, and finally got in line ahead one of the tandems. After bimbling around above the trees and generally being useless, I noticed that one of the tandem gliders was out-thermalling me. This got me very angry. If I was going to be beaten by a crappy tandem glider, I might as well give up on this whole game. There is no point in me buying all this fancy gear if I cannot go places. I followed the tandem on its circular course and was soon above it. The tandem continued to skim past me at an alarming angle. Now it was a matter of survival that I should stay in the thermal successfully and keep above it. My brain was switched on. After another ten minutes I was up and chasing the clouds. This is where I wanted to be. Unfortunately I had no gloves and was wearing only a thin fleece. The parts of me outside the harness were chilled, but my main body was warm. The harness is tight and sealed. It feels like being in a big bear hug with barely room to wriggle my legs or torso. The pressure is calming and reassuring. That was such a joyous thermal. It did not feel like I was flying, so much as dancing on a big soft balloon. 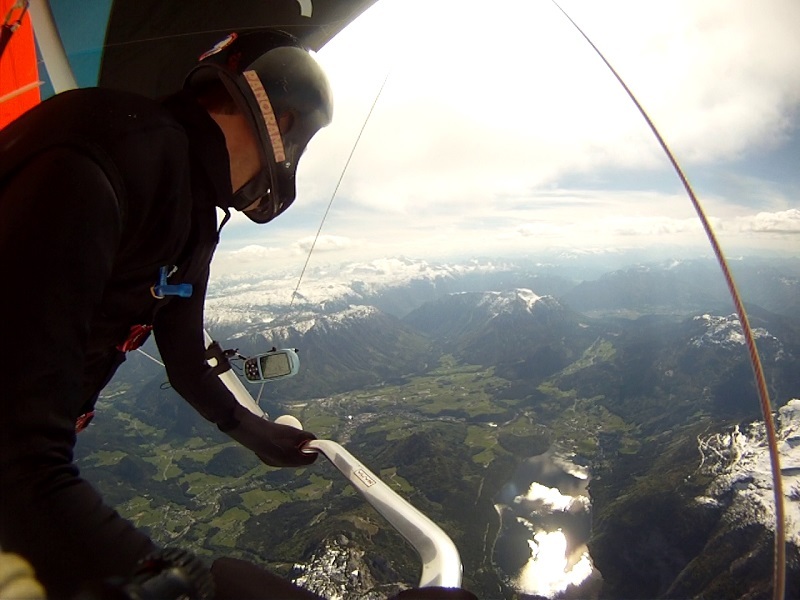 I looked up and watched the black nose of my glider gyrating. 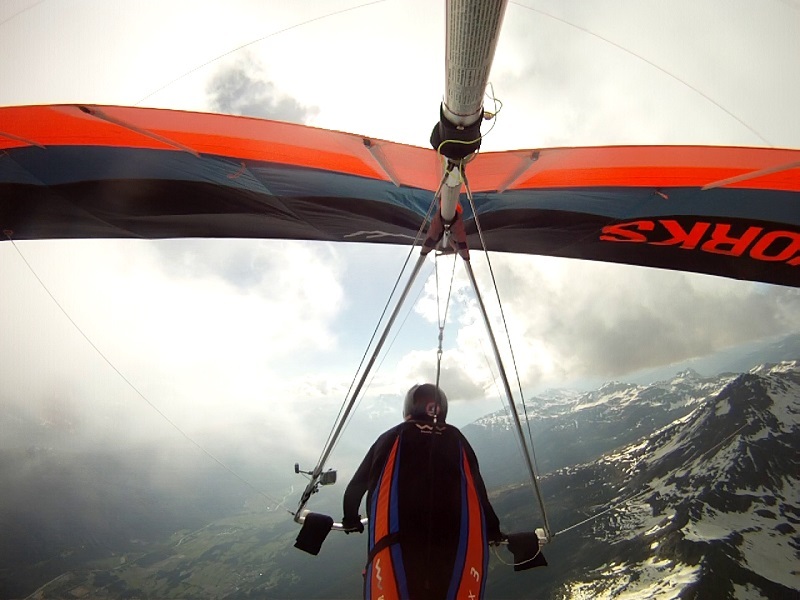 I love my glider. I did not want to pack her up after I landed in the field. We’re bored. Let’s go somewhere new. 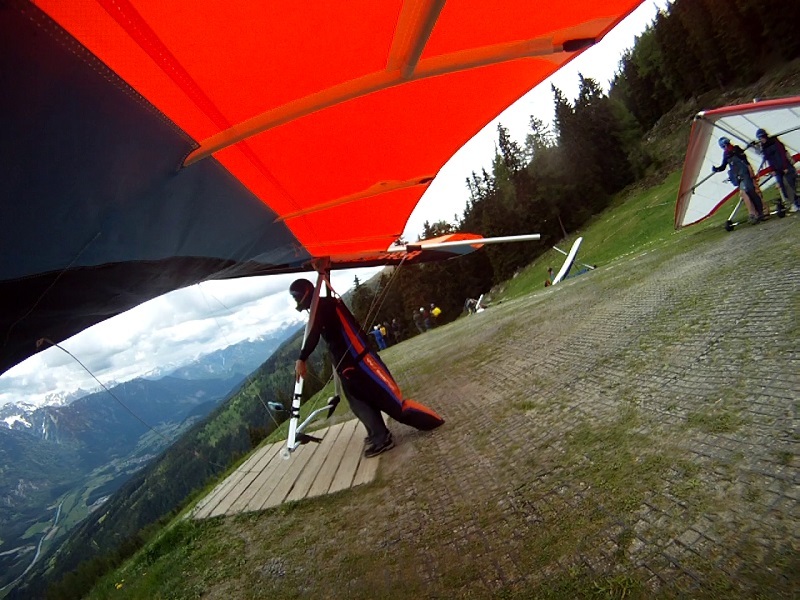 The car was packed and outside the Griefenburg Fliegercamp gate overnight and we left at 6am for Mayrhofen, arriving in the main valley landing field just in time to befriend another intermediate hang-glider who was wondering how he was going to get himself up the hill and his car back down again. We were exactly what he was looking for, and his glider was on our roof-rack within seconds of my making the suggestion that he show us the way. His usual take-off below the road at 1600m above the valley seemed improvized. 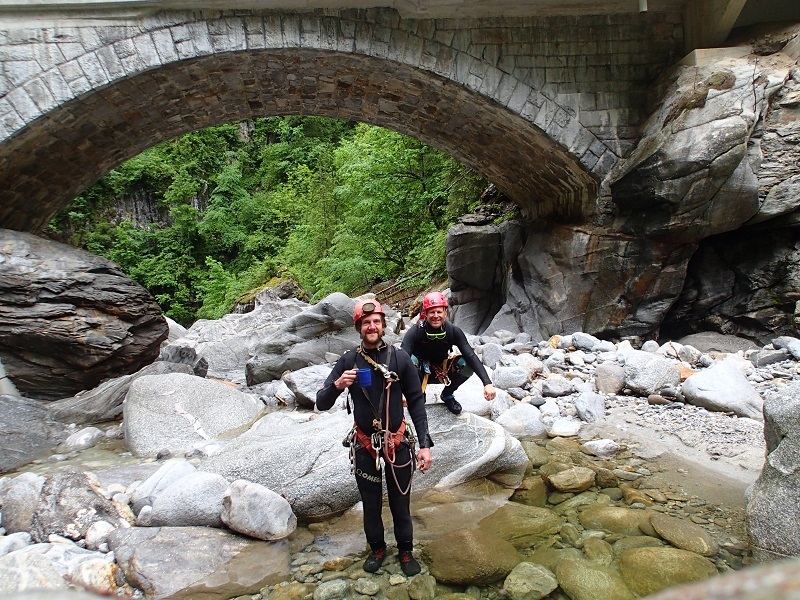 After you set up and get into your harness, you sidle across the slippy grass until you are looking down a gulley. Then you step backwards up the slope as far as you can into the weeds to make your run. For the first time ever I made a huge “WHOO-HOO!! !” on take off. I don’t why, but it felt real good. The video wasn’t on, so there is no record of it, or of all the spirals and turns I did on the way down through the silky smooth air. 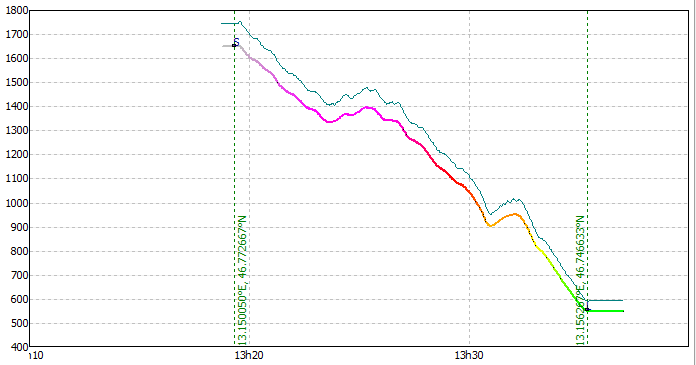 Now I fully realize that the glider cannot turn when it is coasting at minimum sink-rate. I became more sensitive to its need of speed. As usual, the landing was not visible from the take-off, so I had to follow my friend down to the field. It’s bordered on all sides by high tension power cables. “They’re pretty useful because they help you judge your height for your landing approach,” he said. Tom and I pitched our tent in the landing field and went exploring for canyons by bike. 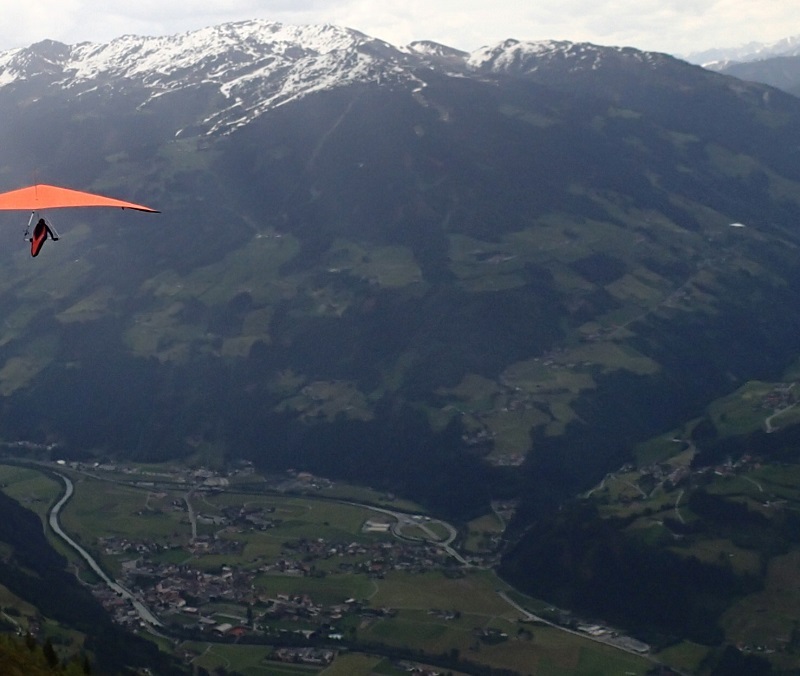 Mayrhofen is at the junction of four valleys, only one of which provides a way out. The two canyons I had details of were in flood, but there was a third called the “Blue Lagoon” that canyon adventure tours used. We didn’t know where it was, but by studying the photos in their brochures we eventually worked it out. 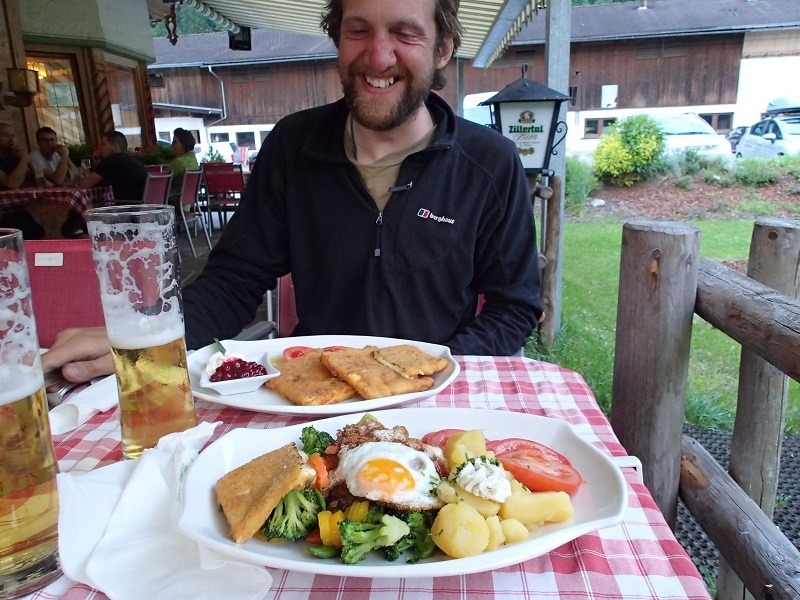 The deal with the camping is that you should eat dinner in the local Gasthof. No problem with that. At 6am we drove up to do the Blue Lagoon canyon. Just as we got changed into our wetsuits, it began chucking it down. Not knowing how the canyon would respond, we jacked. The rain chased us. Pretty soon it was raining everywhere we went. After two hours, we were as miserable as if we had endured it for two weeks. The bunny rabbits were huddled under a camp table going soggy. Maybe this would be a good day to work, I thought. What I need is an internet cafe. 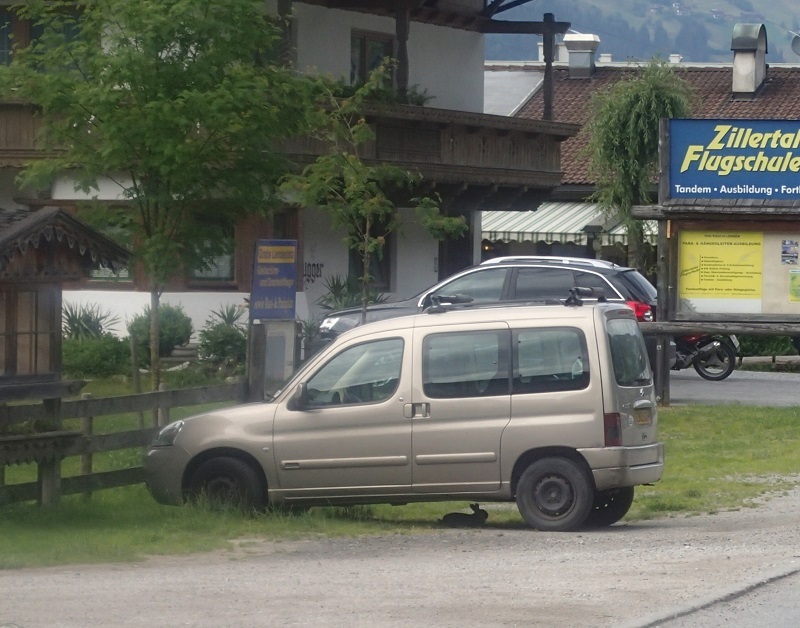 For a completely touristed town like Mayrhofen, how can it be that there are no coffee shops with power sockets and wifi? I thought the whole world runs on these things. We drove to the next town up the valley and got unnecessarily wet wandering around there. There was nothing for it but to set up Cafe Berlingo for that smooth purple smell of burning meths in a trangia. Electricity supplied by an inverter. I did some Java programming with Tom on Tunnel to visualize file layouts of survey data. I should finish what we started at some point. There was a break in the rain overnight, so we were up at the canyon at 6am again making tea in Cafe Berlingo before setting out on the double. If this canyon wasn’t flooded by now, it was never going to be. There were pools, jumps, two pitches, and we scrambled out to the road from the wrong place. Then we were off back to Griefenburg, via the unnecessary toll-road pass (as disclosed by the map of Pingzau we bought), an unnecessary paid parking stop at the Krimmel Waterfall (we irrationally baulked at the 3 euro charge to get in), a visit to a potential flying site in Hollersbach, and a stupidly long drive up a mountain to a monorail toboggon ride that was closed. Frauenbach Canyon was also inspected. It was still gushing forcefully. It was sunny and lovely in Griefenburg. We got our old camp space back. Like I was trying to make a very lame joke about the 80 Germans hang gliding competitors getting their gliders spread out on the deckchairs before the english person has woken up, but their launch window was 11:30am, which meant they all flew off and got out of the way before I was even thinking of being ready. 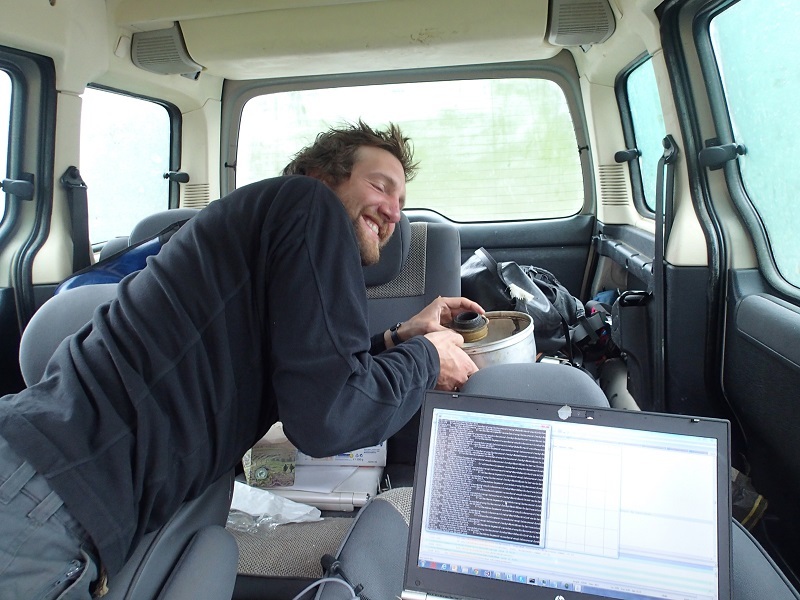 I wanted to wait till the middle of the day when thermals were more reliable and required less expertise. Fat lot of use that did. Bombed out slowly in 44 minutes. 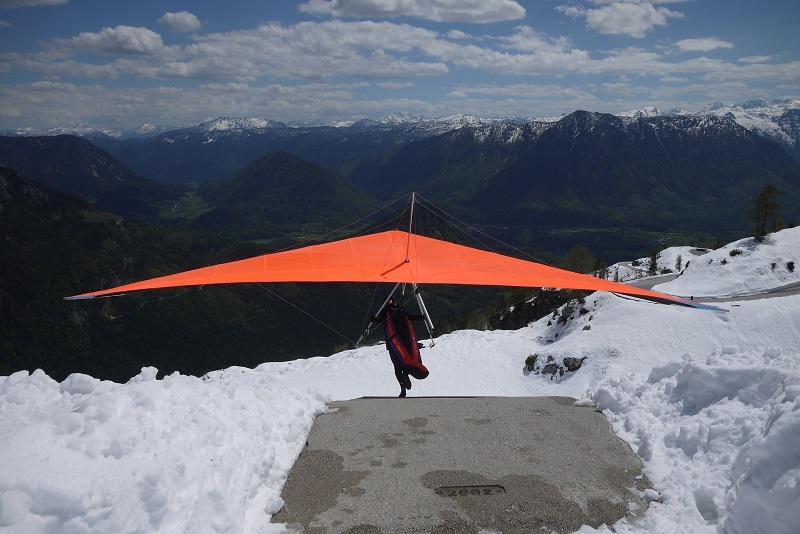 I was the only hang glider in the bottom landing field. What an idiot. I packed up quickly, carried it over to the taxi rank, and then waited for an hour for a few more people to fill it. I bit my fingernails till they bled and texted frustrated expletives to Becka on the phone. The competition pilots were starting to land from having completed their 100 mile round trip task of the day. I was nearly crying. Back up top at 4:20, I was the only glider rigging in a completely empty field. Have to slow down and not make an assembly error. That would look even more stupid. Much happier. Straight up to cloudbase. 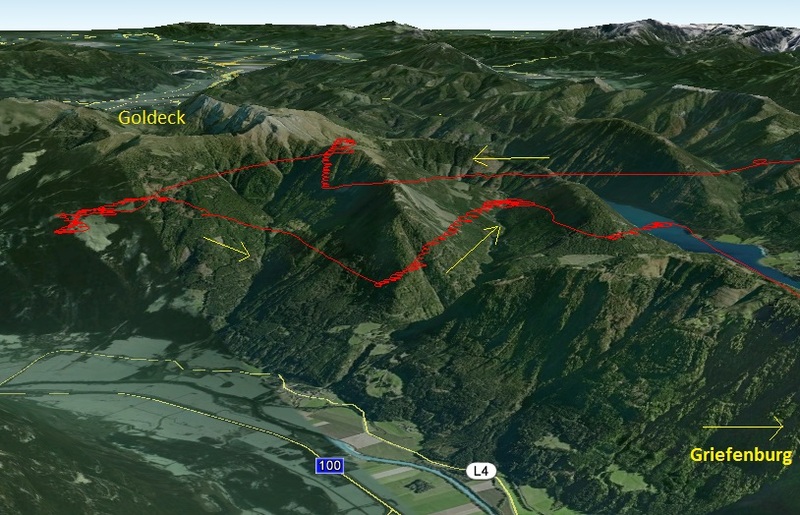 Then, as the evening shadows set, I found some very weak lift on the south side of the valley and stayed up till 7:45pm as the last glider in the sky. No one seemed to care or notice. Not even Tom who could have taken a picture of my crappy landing had he looked up from his book. 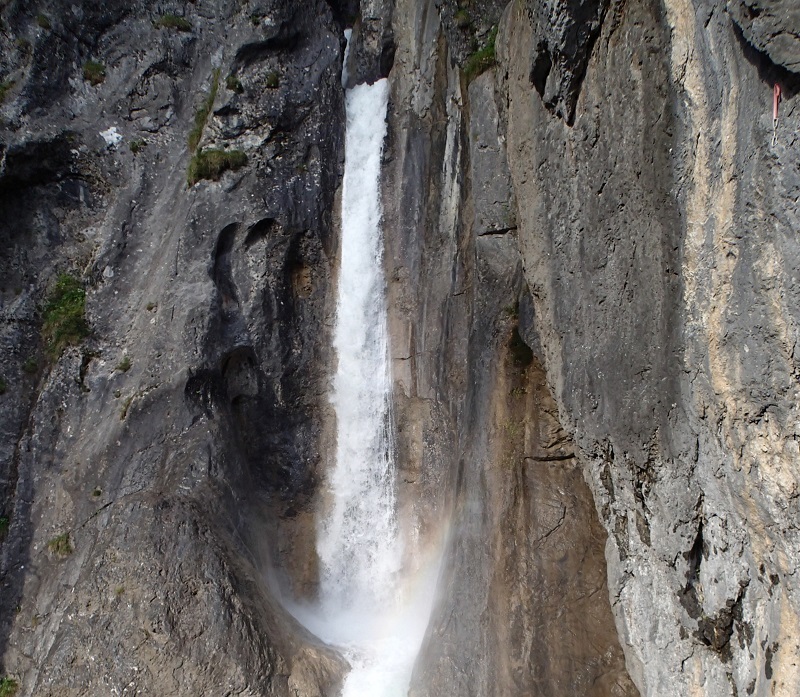 In the morning we decided to go do Frouenbach Canyon, rated as the best in Austria. One look at the terminal cascade and Tom said This is not going to happen. Must be the meltwater from the snow as there has been no rain. I went up, watched all the German pilots take off, then went at 1:20 and bombed out even more spectacularly through horrendous turbulence, not even making it to the landing field. 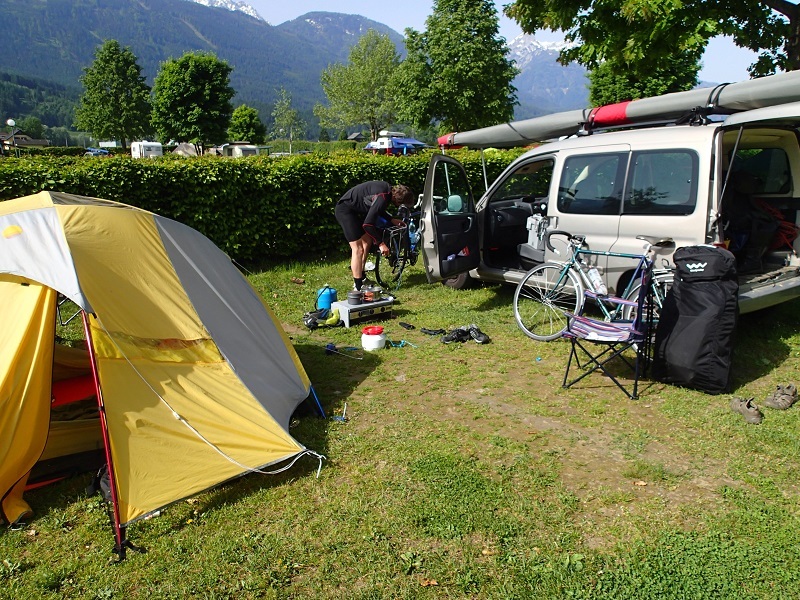 Luckily one of the race organizers mistook me for a competition pilot and gave me a lift back to camp after telling me that I was “a very bad man” for landing in the field of uncut grass when I should have been up high. Here we go again. Straight up to cloud base and over to any mountain peak I chose. Is it me, or is it normal to be stunningly crap half the day, and then do brilliantly at other times? No one else seems to have this. Then, later, it rained, and got ugly. I headed for the large backup field on the other side of the river and got picked up by a gust on the base leg of my approach and dumped into a ploughed field. One of the German pilots there came and shook my hand, for marking a thermal for him that he desperately needed to complete the competition task. Didn’t have anything to say about the landing. The competition only is all that matters to competition pilots. What a surprise. 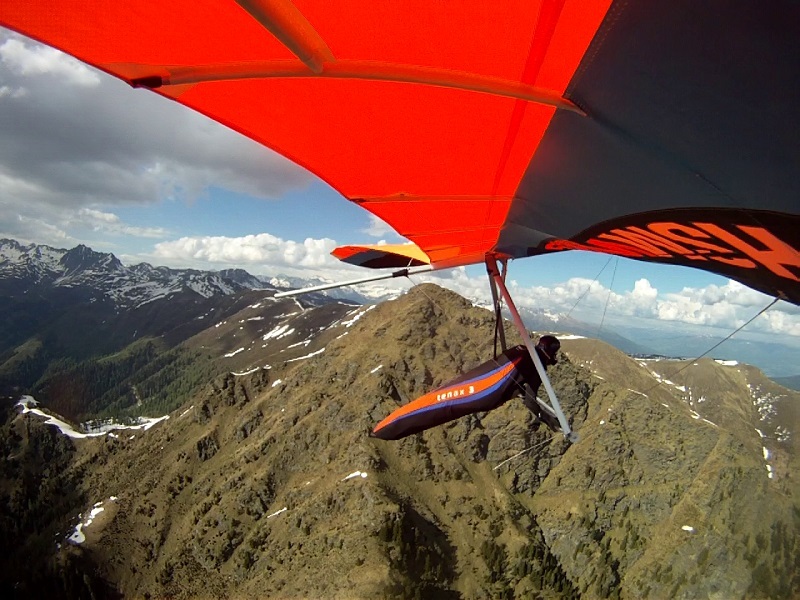 As soon as I get some hang-gliding in, I can’t care less about anything else. All those plans I of doing work and other productive things during the majority of my time I would spend not flying have gone out the window. 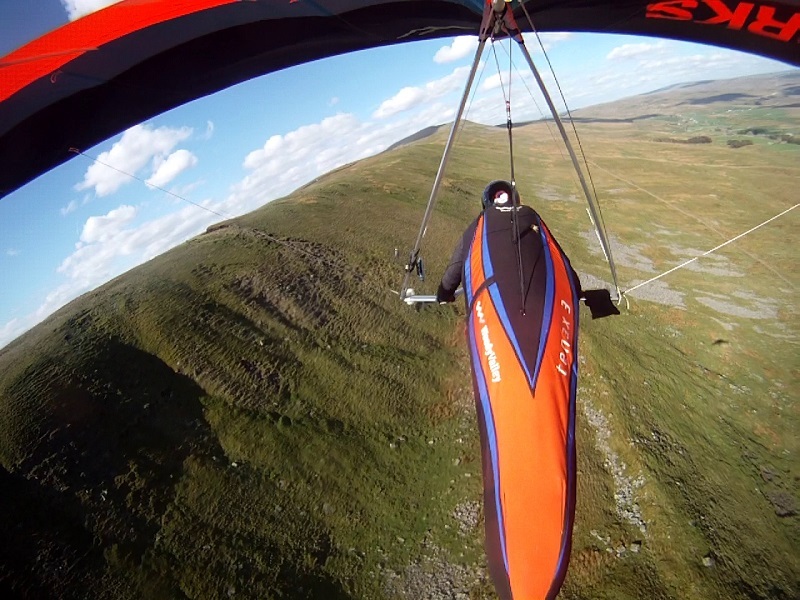 Look, man, I have just spent three and a half hours spinning about in the air currents just getting up to the tops of the mountains at the very limit of my skill. Unless the house has burnt down and Becka has been kidnapped by pirates and held to ransom, it will be difficult to hold my attention. I am in a dream. I am also 1000 miles away and not coming back until June. Meanwhile, there are Euro elections. 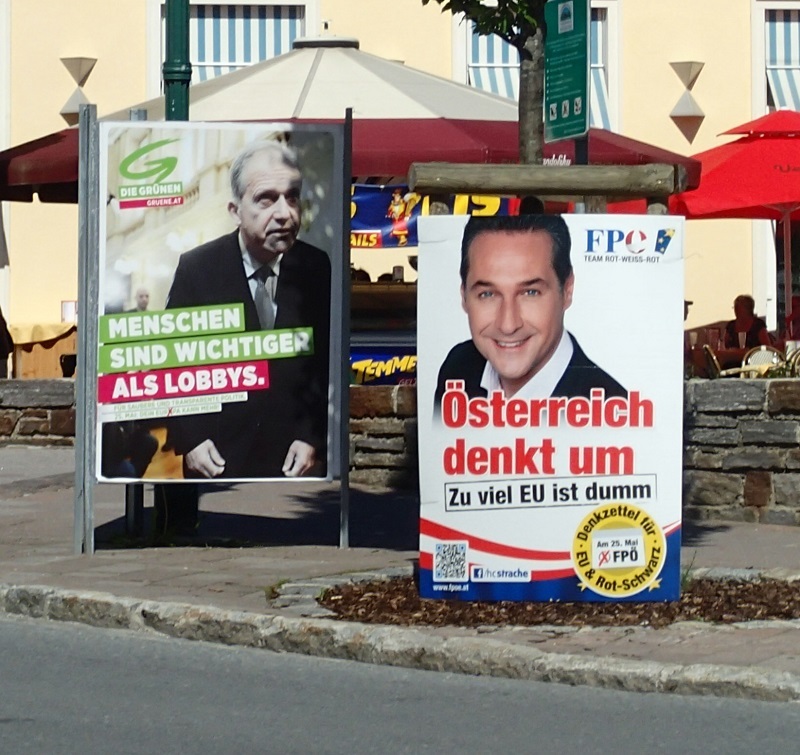 I’m not sure why the green candidate in this Bad Aussee election poster decided to use his zombie impersonation poster. It’s all going to shambles. Democracy in Europe: we just don’t deserve it. At home we have the UKIP clowns, and the Conservative Party copying every crazy policy they can from the UKIP clowns in the belief that it will help them in the polls, when in fact people are not voting for the policies anyway; they are voting for the clowns, because at least clowns are honest. The mainstream politicians at the top are just in it for the ride, like I am with my flying. They don’t have any policies which they actually care about which, if delivered, would mean they would find something better to do with their lives. No one supports the Green Party to get power. Something must get done within the system or it’s all going to hell. Got any better ideas? 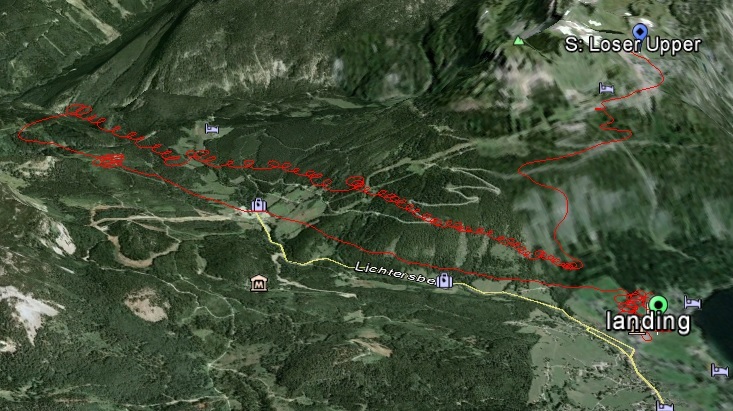 I had a second flight off Loser and went straight down before catching a thermal off the town that I followed right along up the valley in a sheared coil without much upwards component. At some point I decided I was getting a little to far downwind from the landing field by the lake, and made a dash for it. This was supposed to be a good thermalling day, but it wasn’t. I did have the fortune to reread the chapter from Burkhard Marten’s book about how to core a thermal, and realized I had completely misremembered it. I thought it said turn tight in strong lift, and turn shallow in weaker lift. In fact, it’s the other way round: as the lift decreases, you turn tighter so that you can quickly go back and re-enter the strong lift, but while you are in strong lift you delicately search for areas of even stronger lift whilst also opening out into an efficient wide turn that makes the most of the lift area. Anyway, it’s starting to work for me. I have learnt to love circling. 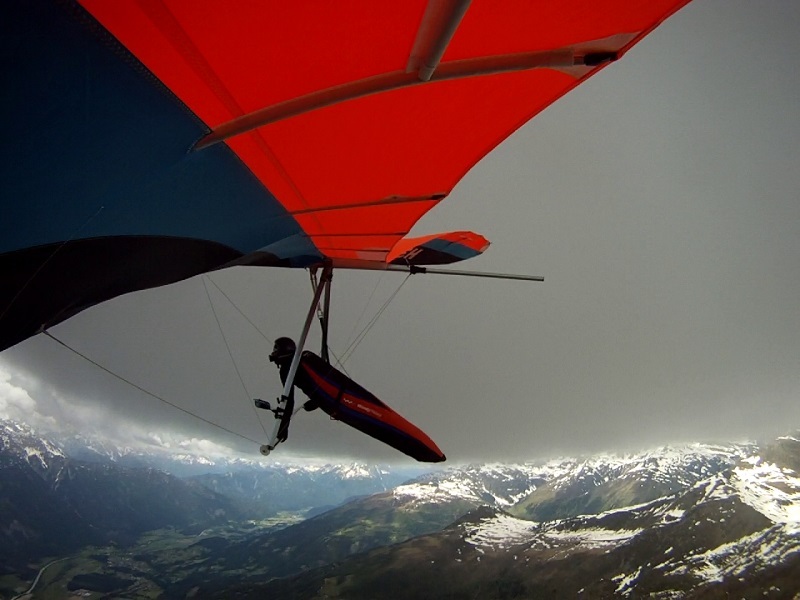 I used to think gliding was boring, like skiing, because all you do is go left, go right, or go straight and on and on and on. But actually, doing the circle is the pattern. It takes about 10 to 20 seconds to execute a circle, and the shape of that circle is the expressive force in terms of interacting with the invisible thermal lift zone, which is itself circular in nature. I got rather dreamy in the air as I got into this notion. Then I saw a shadow on the ground that wasn’t mine. It was from another glider. I hadn’t been paying attention to what else was in the air for a long while. 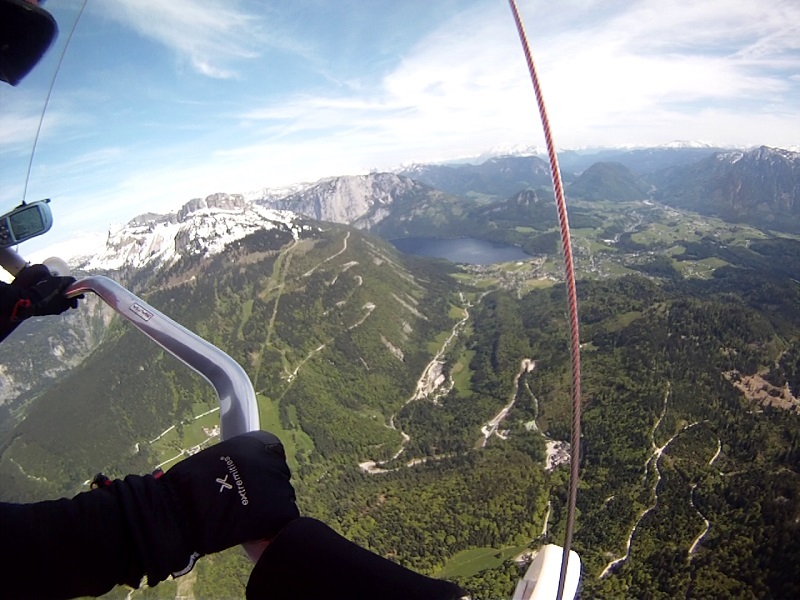 The pilot waved to me as he spiraled up past to a cloud that I couldn’t reach. Though it feels good, I am not as proficient as I should be. Meanwhile, my co-driver, Tom, has been entertaining himself with some long cycle rides to check out the canyons. I promised we would descend a couple when I’m not out flying. Unfortunately, there’s a minor flaw in this plan: usually it’s the thunderstorms and rain that stops flying, which is also not the right time to be going into any canyons. 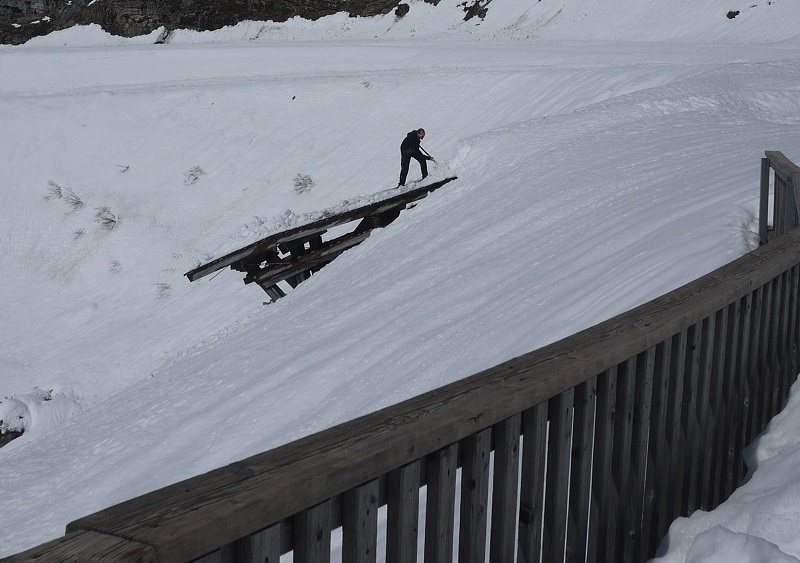 We drive all the way from England to the Loser Plateau only to find that the local Austrians had left their ramp full snow! Lucky we went up the hill early as it took me and Tom 2 hours and a borrowed snow shovel. To be fair, it all fell in the last three days, after a winter of no snow, so it’s only come when nobody wanted it. Then the wind blew from the back until 2:30 pm, when it changed, and I took off. Three hour flight with already very tired arms, just getting to grips with how to thermal properly. Landed on my face in the usual field behind Hilde’s. Time for bed now after one bier that the bar because Tom forgot to buy any in the supermarket on the way back. One good thing, was my magic GPSSMS android app thing worked and successfully texted Tom with my position every 20 minutes when I was not too high. The secret function to make it work was WakeLock. I got tricked into going on my second caving trip of the year. 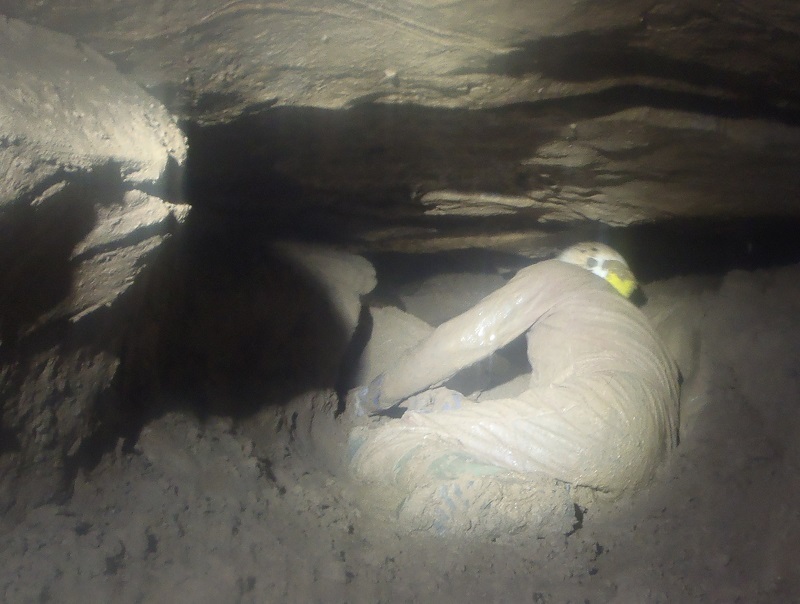 Some friends visiting Snowdonia requested a caving trip nearby, and then got lazy and pulled out after Becka, one of her friends from up north, and a couple of other cavers wishing to inspect some new dig sites were already up for it. These digs are beyond the dig we had dug in ODB for 3 years before it broke through last year into a previously known cave beyond a rarely dived sump. There were two parallel new digs, both good, with drafts detected by watching the smoke from a stinky joss stick. You could hear voices ahead of you from the other one when you had crawled to the far end of each one, so they were connected, although the draft was not circular. The dig I worked at was wide, up a 30 degree slope and full of slightly damp mud and boulders. Excavating each boulder out and rolling it down the slope was satisfying and freed up a surprising amount of space. That was Saturday. Sunday was windy and noisy about the house. Becka went to the science museum in Manchester. I should go to Manchester more often. I delivered some election leaflets and then went to bed, feeling that I had caught a nasty cold just in time for my holidays. Turned out it was probably a lack of sleep. The four hour kite surfing lesson that suddenly popped into the schedule on Monday turned out fine. Hey, it’s more fun than piano lessons. We should all take lessons in a variety of things that are economically useless and we’re never going to be good at. 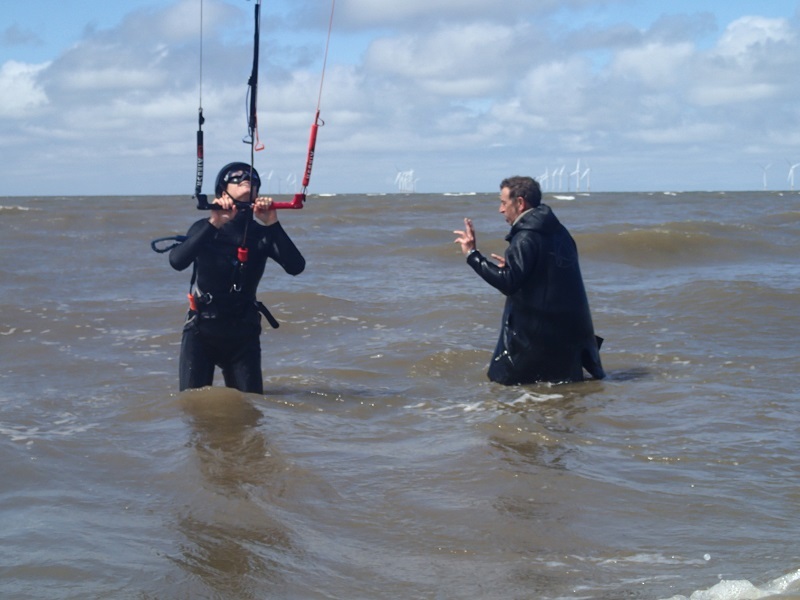 It was light winds, which was good for the confidence, even though the instructor said it was not great for making progress. Still, it was pretty magical to be out there in shallow murky water with the Liverpool skyline on the horizon and the wind turbines not spinning. I do feel these homemade wetsuits are a bit on the chilly side. I actually hate buying gear, so we’ll make do. This seems attractive because it’s going to work whenever the offset distance is very small. 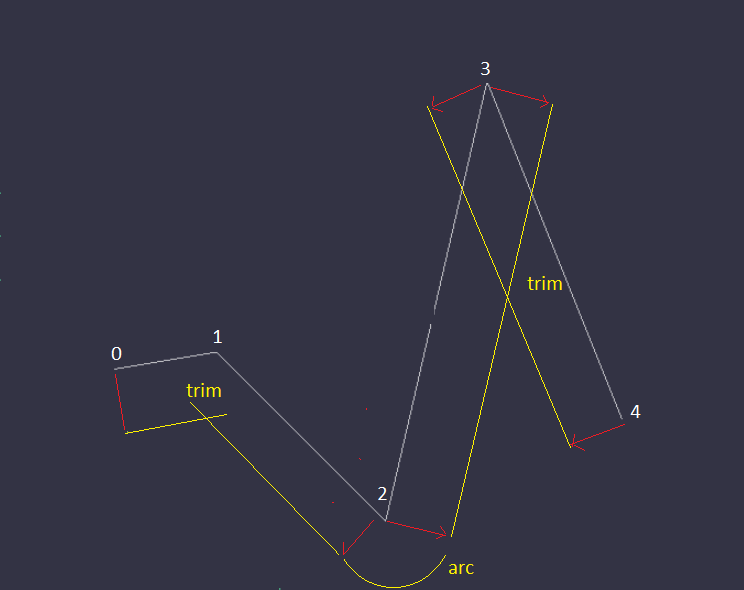 Once you offset further than half the minimum distance between any two vertices, then you start to get multiple self-intersections, some of which involve intersections with the inserted arcs. A little bit of thought and you’ll see that this quickly enters a quagmire and you’ll be debugging it for the next 20 years. This is not an exaggeration. An alternative method is to use Voronoi diagrams. These are great if you want to offset the same polygon by numerous different values, for example if you are producing some offset area clearing passes. The API into such algorithms (if you’ve got one) is daunting, and it’s going to be very time-consuming to add features such as allowing offset to be on only one side. When all else fails, there’s my machining method, where we repurpose one of the waterline machining algorithms to give the answer that we want. Here we imagine converting the contour we would like to offset into a vertical wall of rectangles, and then we run a flat-bottomed cutter against it. My weave sub-sampling waterline algorithm delivers the structure shown in cyan with a contour going all the way round it on both sides. 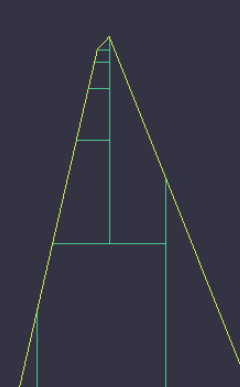 Now the trick is to break the contour so it gives only the right hand side (the yellow curve). We have filters for tracing out partial waterline contours based on the contact angle with the tool-tip — for example producing z-constant toolpaths only where the tool is in contact with the surface at greater than 75degrees so they only appear on the walls. So we could fake this by tilting the vertical wall to one side so that on the upper side the tool tip makes contact with a slope at an angle of less than 75degrees, and on the undercut side the tool shaft hits the top edge giving an effective slope of 90degrees. But this gets messy. It’s better to add in a special toolpath filtering case that simply works for this application and sets the flags to filter out the toolpath when the contact direction either on the left hand side of the contour, or in contact with one of the end-points of the contour if the contour is not closed. 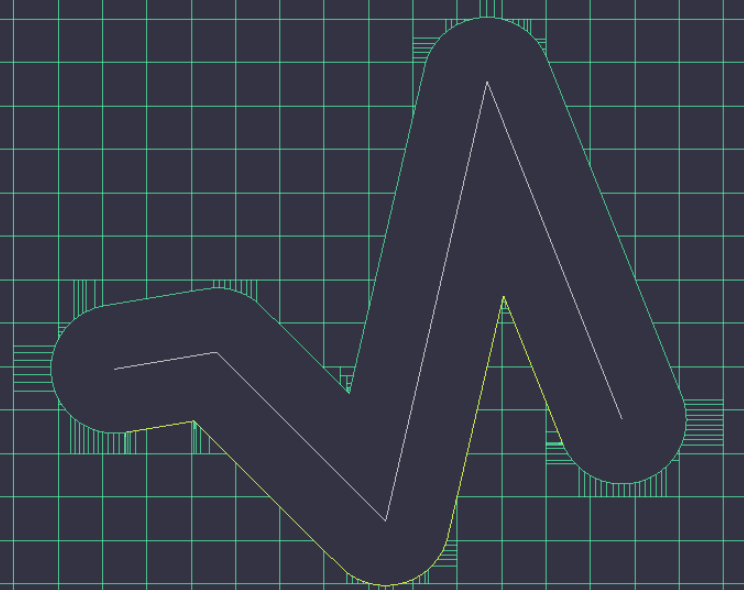 The disadvantage of this method is that your offset contour is made up of hundreds of little line segments that only approximate the offset with regards to the endpoints of straight sections and linearizations of the arcs. But does this matter? Graphically it looks exactly the same. It might be good enough — especially if we don’t have to debug it for the next 20 years. 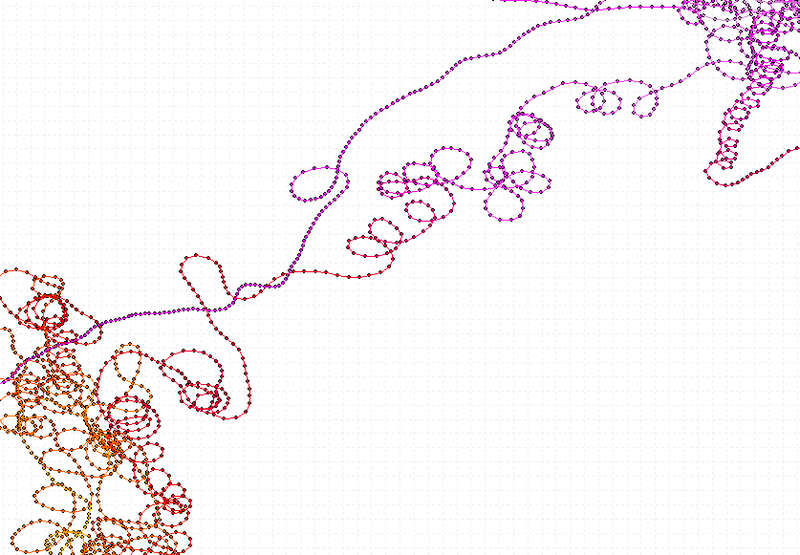 If I was starting this fresh and not trying to get it done in a day, I could encode which line segment or vertex each point of the offset shape was offset from, and then try to rejoin sequences of segments into the same line or arc where they came from the same entity. Then, after that, for segments that jump the gap between a offset point from entity A to a offset point from entity B, I’d extend the two offset passes to the true intersection between A and B. This would be robust almost all the time. And it would be fail-safe because wherever there was a problem it would fall back to the approximate offset — which is almost always going to be better than crashing or giving a properly screwed up result. 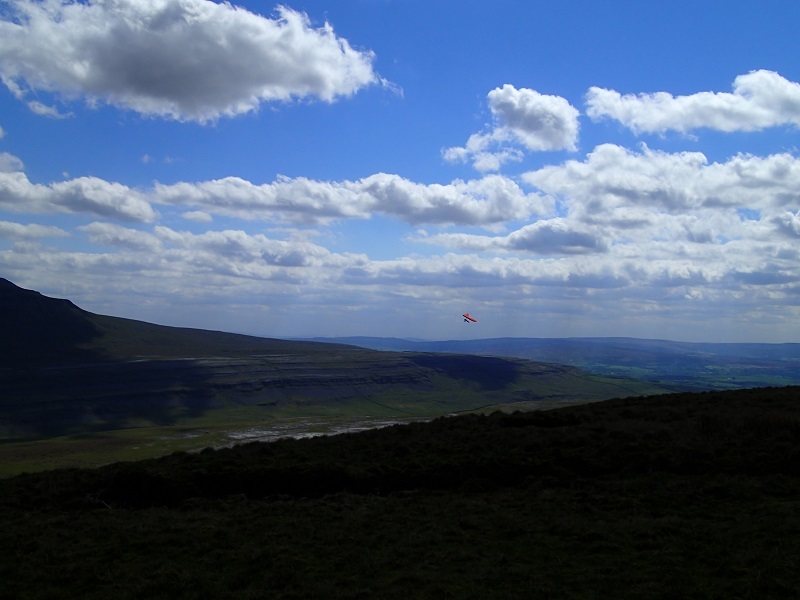 Yes, I got away on Friday to Whernside again with someone from the hack space to help carry up. And again the wind was off to the north and I was not able to go up to reach the clouds. I went down after 40 minutes, then packed, carried all the way back up the hill and flew again for 20 minutes back down to the same boggy field. This made me very cross, after all that effort on such a perfect day when other more competent pilots would have had a whale of a time. My calves in particular were killing me from plodding up the grassy face of this hill twice with the packed glider on my shoulders.